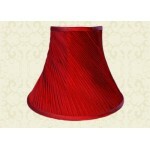 Empire Silk Look Lampshade - A soft radiant sheen provides a touch of elegance to any room in the home. With a wide range of complementing shades and sizes, suited for both ceiling pendants and lamp bases. Empire shades are constructed from 95% Nylon Polyamide & 5% Spandex Lycra for a durable long-lasting life.